From the Calgary (Alberta) Herald, March 14, 1958. 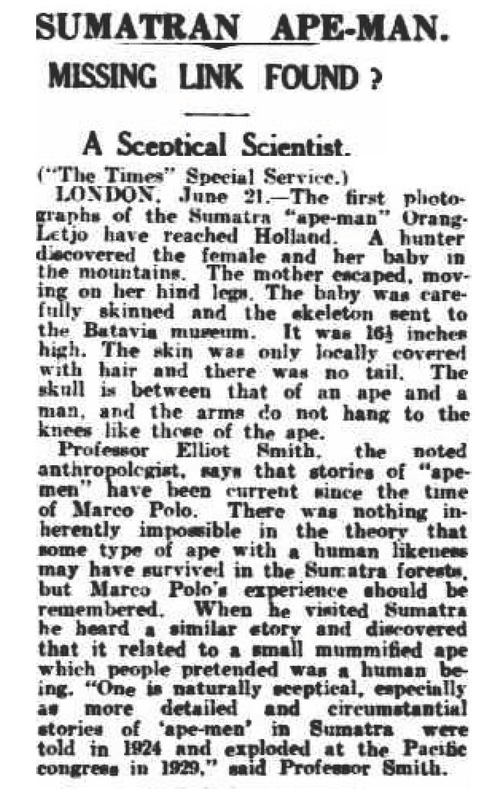 You might recall we ran an article while we were in Sumatra about the discovery of a so-called 'ape-girl'. 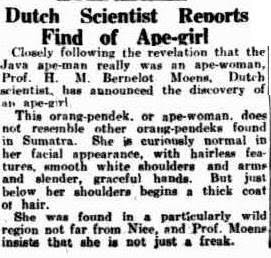 So was this ape girl really an Orang Pendek candidate? Or just a feral girl or lost child? Here we've collected together a miscellany of articles about, and possibly related to, the subject of our recent quest - enjoy! 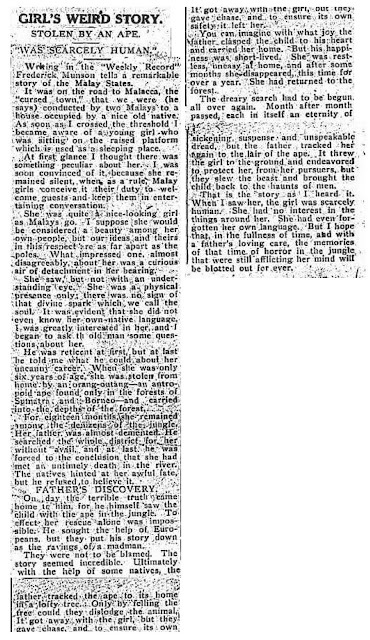 From The Adelaide Mail, August 13, 1932. The Broadford Courier and Reedy Creek Times (Broadford, Vic. : 1893 - 1916), Friday 22 March 1912. Cairns Post (Qld. : 1909 - 1954), Thursday 6 July 1922. Townsville Daily Bulletin (Qld. : 1885 - 1954), Saturday 3 January 1925. 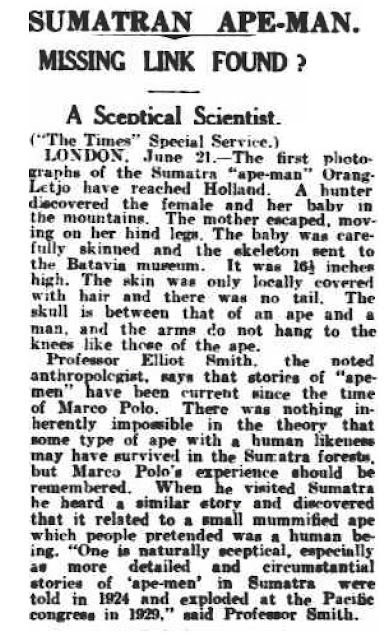 The West Australian (Perth, WA : 1879 - 1954), Thursday 23 June 1932. Advocate (Burnie, Tas. : 1890 - 1954), Monday 27 June 1932. Cairns Post (Qld. : 1909 - 1954), Tuesday 23 August 1932. Actor Willem Dafoe has weighed into the Tasmanian Tiger debate - is it or isn't it? 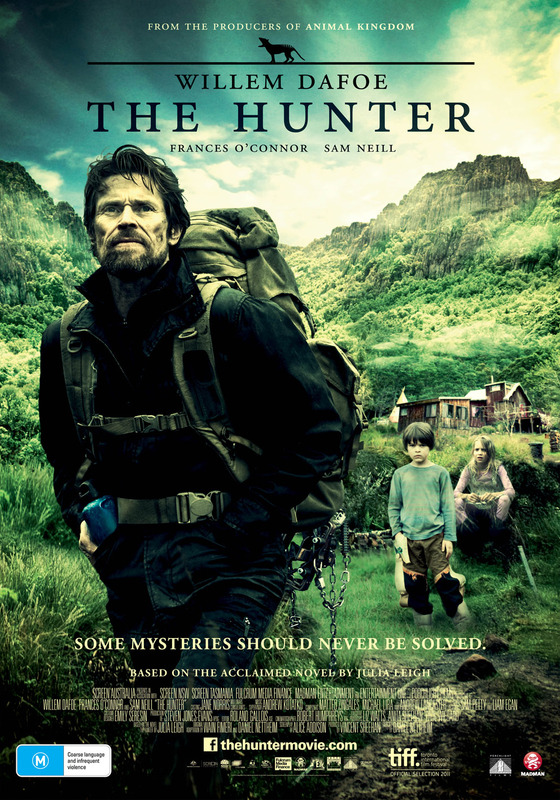 In his latest film, The Hunter, Dafoe plays a mercenary sent to Tasmania by a pharmaceutical company to hunt for the last surviving Tasmanian Tiger. 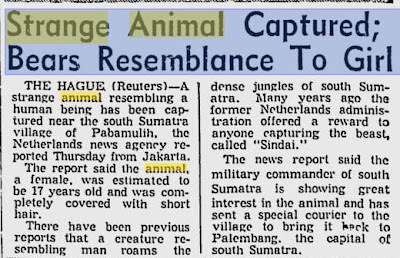 In reality, the 'tiger' was hunted to extinction by Australian settlers, with the last captive specimen dying at Hobart Zoo in 1936. Since that time there has been thousands of unconfirmed reports of sightings, and Dafoe for one remains optimistic about the Thylacine's survival. "I feel a little like a child, but I like to think there is and when you see all that wilderness you think, it's possible," he said. "It's a little bit like I remember when I'd go fishing as a kid, I'd look out at the water and I would envision the big fish that I was going to catch." Director Daniel Nettheim says he hopes the next witness has their mobile phone ready. "Science tells us that really the animal couldn't have survived up to present day, because it lacked the critical mass for breeding," he said. "But so many people on the island believe in it, and so many people claim to have seen it, there is this kind of collective need for it to still exist." 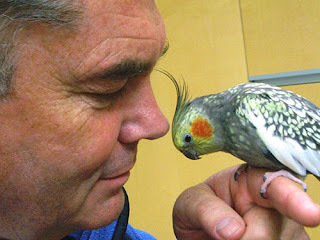 Professor Mike Archer is a palaeontologist, and professor of biological sciences at the University of NSW. 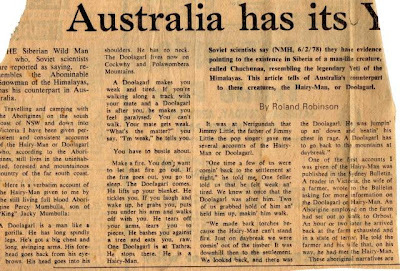 In his time he's been involved with a project to recover the DNA of the extinct thylacine, aka Tasmanian tiger, using a museum specimen. Elizabeth Murchison studies the genetics and evolution of clonally transmissible cancers. 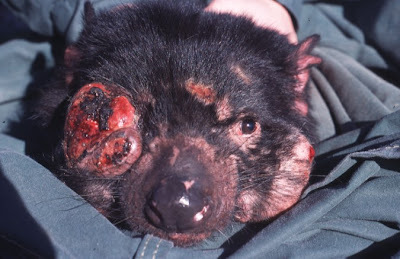 Tasmanian devil facial tumour disease (DFTD) and canine transmissible venereal tumour (CTVT) are the only known naturally occurring tumours that are spread between individuals by the transfer of viable cancer cells. These diseases have evolved independently, and have distinct host species, pathologies and clinical outcomes. DFTD affects Tasmanian devils and is threatening this unique marsupial species with extinction. By using high throughput DNA sequencing technologies, Elizabeth is investigating the genetics and evolution of these two diseases. Elizabeth featured on the TED.com website recently talking about the fight to save the Tasmanian Devil. The film team behind The Hunter shot a series of interviews with witnesses - no doubt a nice little addition to the 'special features' of the DVD when it comes out! “Whether there is still a tiger out there is still hotly debated. 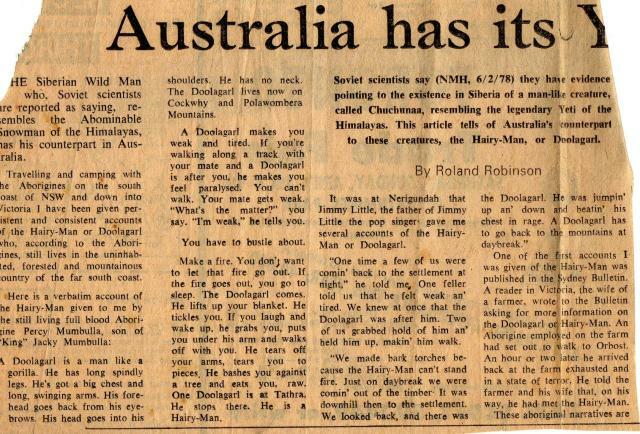 It remains a current and mysterious topic that continues to divide popular opinion, especially in Tasmania. This mystery is key to the journey of Willem Dafoe’s character in THE HUNTER,” director Daniel Nettheim said. THE HUNTER will be released in Australia on October 6, 2011. 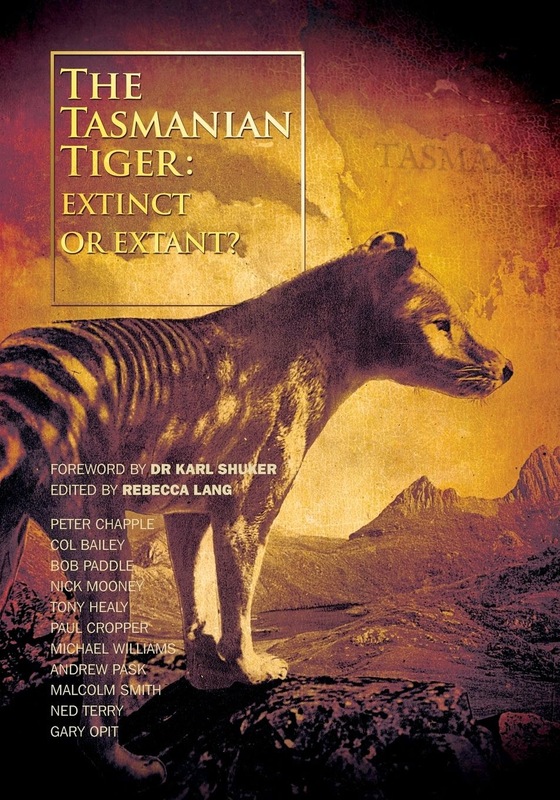 So is the Tasmanian Tiger still out there? The biggest invasive animal eradication blitz in the world is now moving across two fronts with baiters and dogs heading into Tasmania's Central Highlands and the far North-West. The Fox Eradication Program's has completed the first stage of its massive fox-baiting operation, laying 3751 baits across 520 properties and 48,000ha between Southport and Hobart. Detection dogs which follow behind the baiters have not found any fox carcasses or scats. But Fox Eradication Program manager Craig Elliott says that no news is good news in Tasmania's $27 million fight against giving the fox a foothold. "It takes about six to eight hours for the baits to have an effect on a fox. 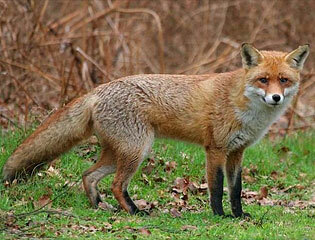 From mainland experience a baited fox would go away and curl up in a hollow log or a den to die," Mr Elliott said. The program involves the laying of 40ml Foxoff and Probait baits which contain 3ml of 1080 poison. Fox Eradication Program operations manager Nick Bates said the blitz was targeted and carefully designed to minimise risk to Tasmania's native wildlife. Some Tasmanians have written to federal Environment Minister Tony Burke outlining their concerns the program was putting already-endangered animals at risk of poisoning. "I call on you immediately to order the cessation of all fox baiting in Tasmania until a thorough, independent investigation is completed," one letter to Mr Burke says. "I would state that the fox baiting campaign will go down in Tasmania's history as more of a tragedy than the government of the day placing a bounty on the now-extinct thylacine." 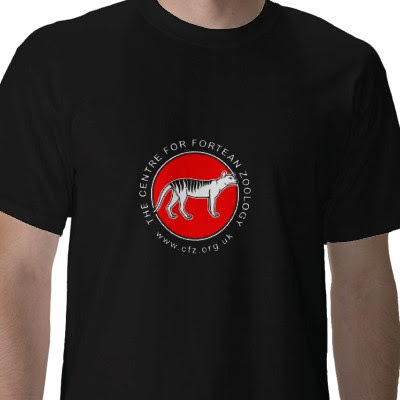 Forget pith helmets and khakis, this is what all of the edgy cryptozoologists wear when they're looking for cryptids - the classic black Centre for Fortean Zoology logo tee. The team en route to the forest - it was no easy slog! The team arrived home in dribs and drabs over the weekend - Holland, the UK and Australia - tired but elated from two weeks of hard yakka in the jungle looking for one of the Southern Hemisphere's most interesting cryptids: Orang Pendek. Between us all we have dozens of game trail camera images, prints and photographs to analyse and send off for expert analysis. It was a fruitful trip! This was despite frequent illness, torrential rain, language barriers and negotiating harsh terrain on a daily basis. Thankfully everyone has arrived home safe - and had a great time to boot. 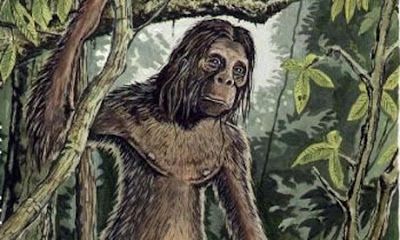 A ten strong team led by Adam Davies has built upon the existing evidence for Orang Pendek – the “short man of the forest” in Western Sumatra. They have just returned from a two week expedition with what could be the world’s first handprint of the creature. This of course requires independent expert verification and although there are similarities to previous prints, it is still unlike any other verified so far. Independent field researchers Tim De Friel and Dave Archer. Notably Archer witnessed the Orang Pendek in the flesh on expedition in the same area in 2009. 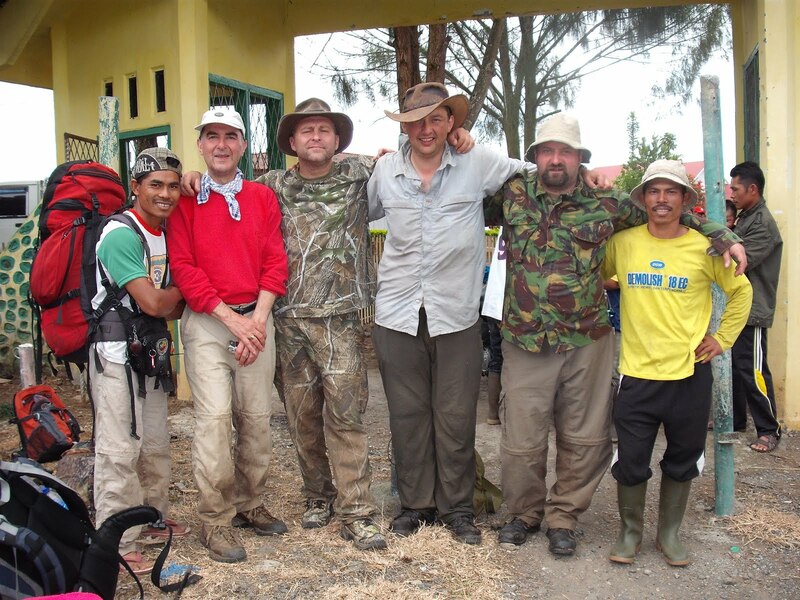 The expedition concentrated its searches around Lake Kerinci and the “gardens” area in the lower elevation rainforest, both areas of previous sightings and secondary evidence. Whereas the “gardens” team returned with three partial footprints, the possible handprint, was found in the jungle surrounding Lake Kerinci. 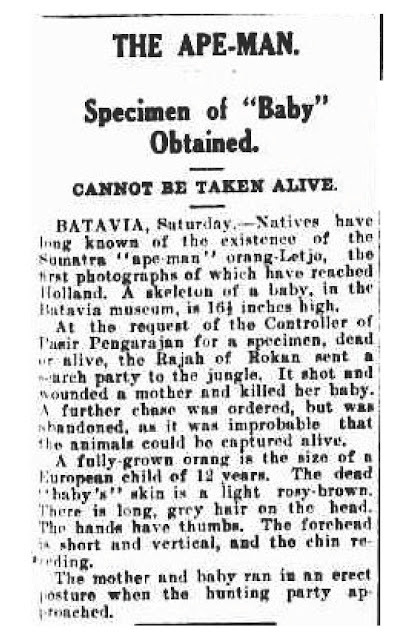 The print is to be sent for independent analysis, but furthers the body of evidence for Orang Pendek. Unidentifiable hairs also found in the immediate vicinity are to undergo similar independent testing. Special thanks to Mike Hardcastle over at Steampunk and Phenomena: Mad Science and Natural History, Victorian Style. More than 1000 Tasmanian devils are expected to live in the Barrington Tops in 10 years time. The rapidly growing population is the result of the Devil Ark breeding program, which was opened yesterday. The program, established on 500 hectares of land donated by the Packer family, aims to establish a population free of the contagious devil facial tumour disease. 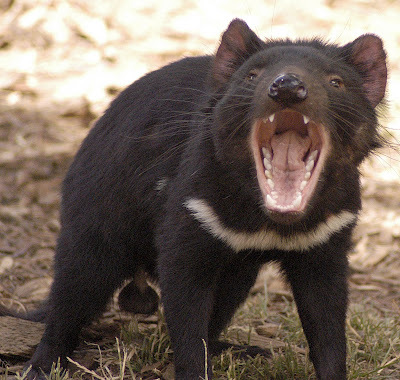 The disease has reduced Tasmania's devil population from 200,000 to 20,000 over 15 years. The Barrington Tops was chosen for the project because it closely mimics conditions in the devils' native environment. After years of planning, the Devil Ark program began this year with the release of 43 devils in January. The population is expected to have doubled by December. Now we know these pictures probably don't hold a candle to the real Cigau, if it exists (or ever existed), but for the purposes of illustrating what we're on about they will have to do. So just what is the Cigau (pronounced chee-gow)? It is Sumatra's other cryptid, a golden-furred big cat - generally described as smaller but more stocky than a tiger, sporting a lion-like mane, a short tail, and forelegs longer than its hind legs, the latter detail reminscent of the hyena - known also as the Sumatran Lion. What on earth? 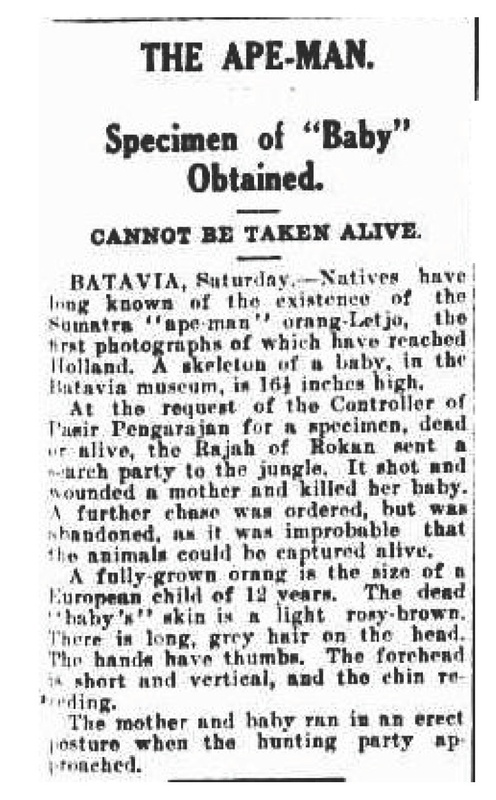 Well why not - we are after all hunting for a pint-sized human-like ape, so the more the merrier where cryptids are concerned. 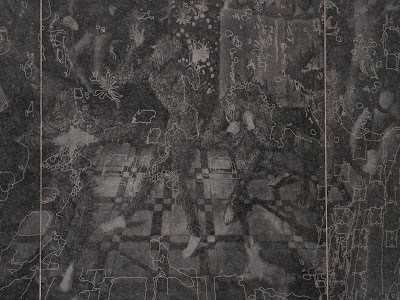 "Back when Sahar's father was a bachelor (as Sahar is the same age as me this would have made it some time during the 1960s) he saw the cigau. Kerinci trades with other parts of Sumatra. They exchange rice for goods like silk. Sahar's father and four other men were traveling a trade route. The path led through the jungle. One of the men had committed a great taboo. He had eaten rice straight from the pot rather than waiting for portions to be given out. "In the dead of night the cigau came from the forest to claim him. It stalked right into their camp and dragged him off into the darkness. It was smaller but stockier than a tiger. 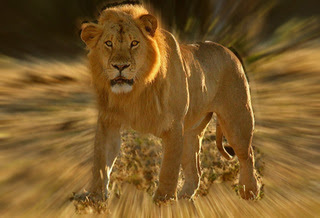 It had a silvery lion like mane and golden fur. 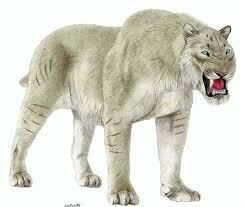 Its forelegs were longer than its back legs like the build of a hyena. It had a short, tufted, cow like tail. The men searched the jungle franticly for their lost comrade but when they found him he was minus a stomach, disemboweled by the cigau. "Sahar's father also spoke of a cigau who laired near a fallen tree that formed a natural bridge over a river. It would swim out and devour those who slipped into the water. "Debbie also commented that she had many recent reports of the cigau in water. Most of them mentioned it flinging back its mane to shake of the water." The plight of the Tasmanian Devil has been recognised by NSW Minister for the Environment, Robyn Parker, today confirming a $600,000 funding boost to assist the Devil Ark program. Minister Robyn Parker was joined at Barrington Tops for this morning's announcement by local MP for Upper Hunter, George Souris, and local Mayor Clr Lee Watts. “The iconic Tassie Devil is at serious risk of extinction due to devil facial tumour disease with population numbers falling from around 250,000 in 1996 to just 20,000. At that rate they could be extinct in the wild within 10 to 15 years,” Ms Parker said. “Supporting the Devil Ark breeding program was an election commitment that I am pleased to confirm that we have delivered on. “The program involves breeding an insurance population of Tasmanian Devils at the facility at Barrington Tops, which is climatically similar to Tasmania. The Tasmanian Devil’s will eventually be reintroduced into Tasmania. “In January 43 Tasmanian Devils were released into the Barrington Tops facility, which is the largest mainland breeding facility in the country, more than half of the breeding age females now have young, what a fantastic result. “The securely fenced, large free-range enclosures allow the animals to live close to their natural state, ensuring that they’re ready for reintroduction into the wild when the time is right,” Ms Parker said. Devil Ark will provide a viable and sustainable model from three principal breeding programs: intensive, large managed and free-range enclosures. Once the centre reaches a Devil population of 200 the cost to keep per Devil per year will drop to just $900, well below some zoo costs associated with keeping the animals. 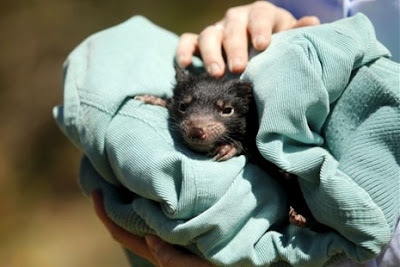 Devil Ark will breed and maintain Tasmanian Devils for a period of up to 30 years. “This program will contribute to the long-term survival of the Tasmanian Devil by providing a world-class breeding facility to house a healthy insurance population of this wonderful Australian animal. “The local MP George Souris and I would like to take this opportunity to commend the dedicated staff at Devil Ark for their great work in helping to keep this Australian icon alive. As members of the NSW Government we are very proud to support such great work,” Ms Parker said. A treasure trove of fossils up to a million years old has been found in three caves under the Nullarbor. Palaeontologists returned last month from their fifth expedition to Last Tree Cave, Flightstar and Leaena's Breath, on the WA side of the Nullarbor Plain, where about 100,000 bones were collected during the past two field trips. 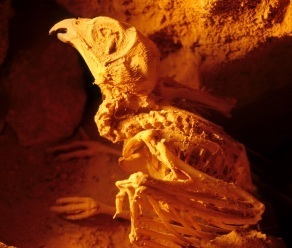 Flinders University palaeontologist Gavin Prideaux said the caves, discovered in 2002, were littered with fossils. "There were a lot of complete skeletons of megafauna species just sort of lying on the cave floors," he said. One of the most impressive finds was an almost complete skeleton of a Thylacoleo carnifex, or marsupial lion - a prehistoric animal that was the size of a leopard, built like a bear and able to stand up like a kangaroo. It had huge claws and the most powerful bite of any known mammal. 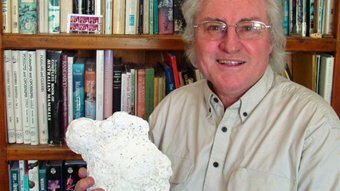 WA Museum documentary director Clay Bryce, who has been involved in the project since its inception, described the caves as a treasure trove of extraordinary fossil material. "From one skeleton we suddenly went to 11 Thylacoleo skeletons, tree kangaroos, koalas, Thylacines, giant wombats, untold numbers of birds, giant kangaroos, Procoptodons, smaller species of kangaroo, horned wallabies, the list goes on and on," he said. Dr Prideaux said the caves had acted as an animal trap, catching animals that fell through the entrance and birds that could not find their way out. On the most recent expedition researchers rescued two live birds that had become disoriented in the caves. Dr Prideaux said at least eight confirmed new species had been found in the caves and that was likely to rise to 15 to 20 new species as more bones were analysed. The research was part-funded by National Geographic. The CFZ's Richard Freeman is one of Britain’s few professional cryptozoologists, and has worked at the Centre For Fortean Zoology since 1996. He is currently writing a book about the Orang Pendek. This is an interview Richard did with Debbie Martyr, an ex-pat British journalist who now works in tiger conservation. Debbie has seen the Orang Pendek firsthand and started up the website www.orangpendek.com to document her research into the mystery beast. The interview originally appeared in a 2004 edition of the Fortean Times. RICHARD FREEMAN: Tell me how you first became interested in Orang-Pendek? 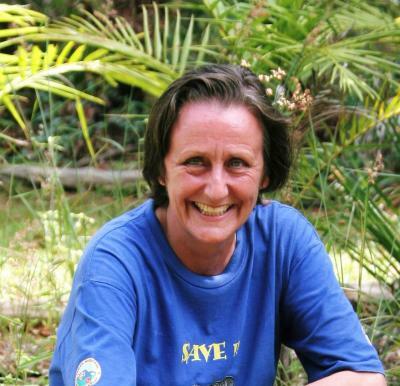 DEBBIE MARTYR: I was travelling in Sumatra as a journalist in 1989. I was climbing Mount Kerinci and heard of a legendary animal that I thought would add a bit of colour to my travel piece. Then I started meeting people who claimed to have seen something. At that stage I didn’t believe or not believe; I was trained as a journalist, which is a respectable profession, so I took a look into it. RF: Can you tell me about the first time you saw orang-pendek? DM: I saw it in the middle of September; I had been out here four months. At that time I was 90 per cent certain that there was something here, that it wasn’t just traditional stories. I thought it would be an orang-utan and that it would move like an orang-utan, not bipedally like a man. I had my own preconception of what the animal would look like if I did see it, and I had been throwing away reports of the animal on the basis of colour that didn’t fit what I thought the animal would look like. When I saw it, I saw an animal that didn’t look like anything in any of the books I had read, films I had seen, or zoos I had visited. It did indeed walk rather like a person – and that was a shock. RF: What did it look like? 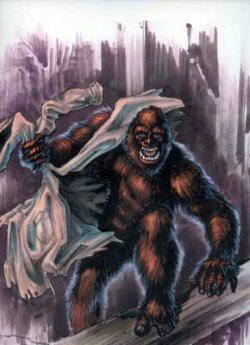 DM: A relatively small, immensely strong, non-human primate. But it was very gracile, that was the odd thing. 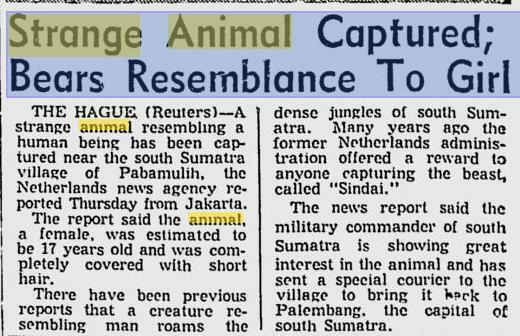 So if you looked at the animal you might say that it resembled a siamang or an agile gibbon on steroids! It doesn’t look like an orang-utan. Their proportions are very different. 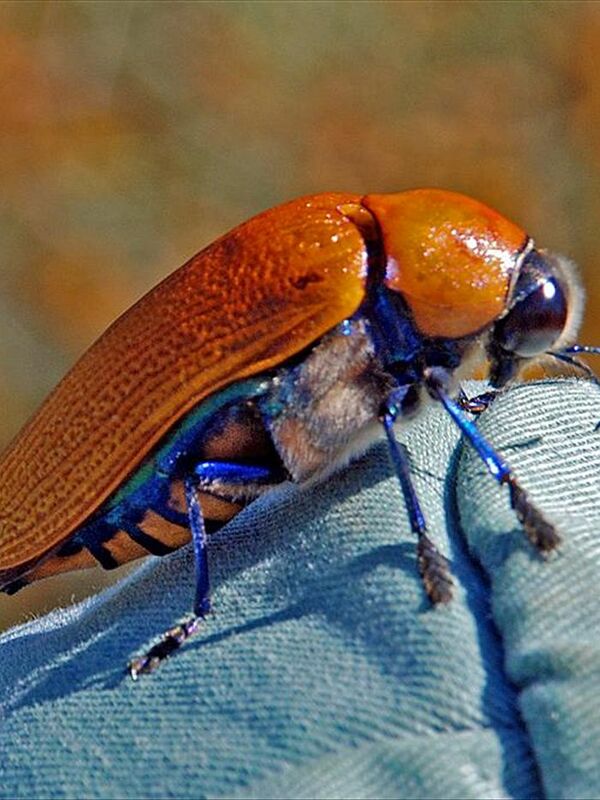 It’s built like a boxer, with immense upper body strength. But why an animal with immense upper body strength should be lumbering around on the ground, I don’t know. It makes no sense at all. It was a gorgeous colour, moving bipedally and trying to avoid being seen. I knew there was something in the vicinity, because the action of birds and primates in the area meant that there was obviously something moving around. So I sent a guide around as far as I could to where the disturbance was. Whatever was concealed in the undergrowth would try to avoid my guide and move away in front of him. I was concealed, looking down over a small shallow valley. We didn’t know what we were going to see. It could have been a bear, it could have been a tiger, it could have been a golden cat, or anything. Instead, a bipedal, non-human primate walked down the path ahead. It was concentrating so hard on avoiding my guide it didn’t look towards me. I had a camera in my hand at the time but I dropped it, I was so shocked. It was something so new my synapses froze up for a minute trying to identify something I hadn’t seen before. RF: You have seen it a couple of times since. Could you tell me about those sightings? DM: I saw it again about three weeks later. Again, it was on Mount Tuju and, again, I had a camera in my hand but I froze, because I didn’t know what I was seeing. It had frozen on the trail because it had heard us coming. All I could see was that something across the valley had changed. I looked through a pair of binoculars. Something didn’t look quite right in the landscape. By the time I trained on the area the animal had gone. Those were the only times I could have got a photo of it. I have seen it since, but fleetingly. Once you have seen an animal you can recognise it. If you have seen a rhino you can recognise a bit of a rhino. RF: Can you tell me a bit about your theory of why orang-pendek walks bipedally? DM: Everyone has pet theories. I think the only thing that makes sense is the massive volcanic event about 50,000 years ago that created what is now Lake Toba up in northern Sumatra. It created a [geographical and biological] divide. You get the Malayan tapir down here but not up there. You get the Thomas’s leaf monkey up there but not down here. In recent geological history it was the biggest volcanic event. It was absolutely immense and would have caused massive habitat destruction right across Sumatra and into Malaysia. All I can think is that surviving animals down here would have had to become terrestrial. They would have found themselves with very few trees. RF: But 50,000 years is a very short time for something to change so radically. DM: What you could suggest is that 50,000 years would be sufficient time for something to change its muscles. Maybe there wouldn’t be much skeletal change, there would be some but not a lot. But the main change would be in the muscles. An adaptable animal that is being forced to walk erect. Gibbons can walk erect so perhaps another, larger ape could become bipedal. Speciation – that’s what makes the most sense. RF: What do you think of reports of other bipedal apes in Asia? DM: I don’t believe in the abominable snowman. 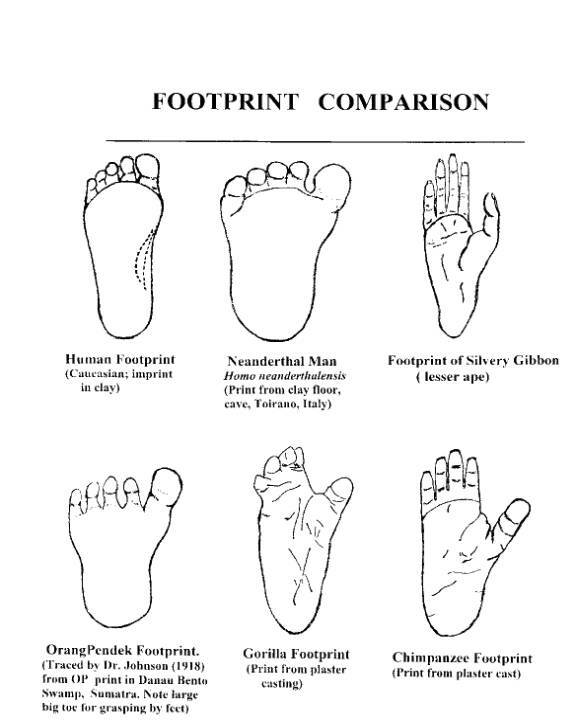 My father was in Tibet and saw what he was told were yeti tracks, but they turned out to be bear footprints. They are just too big. I think three-metre-tall (10ft) apes are too big. Maybe there has been exaggeration through fear. I don’t believe in things like bigfoot. The yeren in China might exist. Orang-utans lived in China in the Pleistocene. It could be speciation in the orang-utan. The forests of Assam might be a good place to look as well. 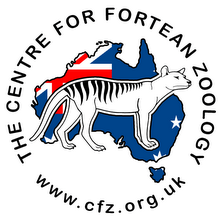 As we embark on the CFZ Sumatra Expedition, we have lined up a series of themed posts during our absence. Pictured above is the CFZ's Richard Freeman (right) with a freaky-looking and rarely blooming Sumatran plant known as the Titan Arum, or ‘corpse flower’, which grows to the amazing height of 2-3 feet. As well as being the world’s biggest flowering plant, it is also the smelliest as it goes into the final phase of its six-year life when it gives off a pungent odour, reminiscent of rotting flesh. The plant is a distant relative of the ‘lords and ladies’, a British lily. It is distinguished by its yellowy, fleshy spike known as a spadix. This is wrapped in a single cream leaf which, when opened, reveals a rich crimson inside. When the plant is ready to attract pollinators, the spike heats up and gives off the smell which disgusts humans but is very attractive to insects. Hence it's nickname 'corpse flower'. It then develops the fruit which attracts birds. "By a remarkable stroke of luck, a specimen of the Titan arum, the world’s largest flower (below), and one that blossoms only once every 10 years, was blooming nearby – an unmissable opportunity. The village backed onto an area called "the garden", cultivated land that is used for growing crops but which merges with the jungle seamlessly and is, in some areas, very overgrown. Due to the garden’s more open nature, one usually encounters more wildlife here than in the jungle proper, and this is where the T. arum was to be found. It lived up to its name; it is truly the Godzilla of flowers, looking like some strange surrealist sculpture or something made by the BBC special effects department. It stood 7ft (2m) tall, the elephant’s foot of a stem widening into a barrel-sized green bowl. This in turn flared out into the petal, which looked like nothing so much as a Spanish Flamenco dancer’s red dress. Finally, a phallic stamen of bright yellow stabbed upwards from within the petal’s folds. The scent of the T. arum is said to be like rotting flesh; it is pollinated by flies attracted to what they assume is a cadaver. We could detect no such smell around our flower – but close by the fresh carcass of a bearded pig was stealing its thunder." 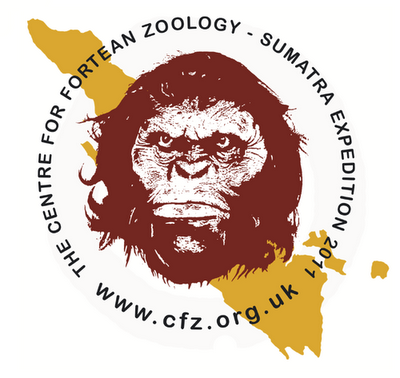 We'd be remiss if we failed to mention three very important people who have kicked in to help us on our Sumatra expedition. David Hearder and Joy Williams have generously supported the purchase of game cameras for the expedition, and I hope for their sake and ours we capture something of interest on what has become a staple part of every 21st century cryptozoological adventurer's toolkit. And a big thank you to our good friend and author Paul Cropper, who has supplied us with some quite spectacular kit to ensure we don't get Typhoid or any other waterborne nasties, and have a hotline to the modern-day equivalent of the Thunderbirds should we hit a patch of strife. Thank you to David, Joy and Paul, and also to anyone else who has purchased a CFZ t-shirt, kicked in some dollars for a game camera or visited one of our sponsors through this page. It all helps! As we slog through the jungles of Sumatra, we've lined up some posts to keep you entertained. 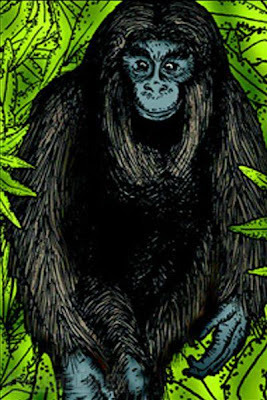 This latest one profiles our quarry, the legendary Orang Pendek, the man-ape of Sumatra. Deep in the Kerinci region of Sumatra, a creature is said to exist that has a lot in common with apes - and humans. The so-called Orang Pendek (literally meaning 'short man' in the native tongue) is a ground-dwelling bipedal ape about three feet tall. It also leaves behind a somewhat unusual footprint, as seen below compared to several others. The animal has allegedly been seen and documented for at least one hundred years by forest tribes, local villagers, Dutch colonists, and Western scientists and travelers. "He is a beef farmer in a valley about 20 kilometres west of Kempsey, and Ron Clarke was with his sister, now Joan Delforce of Wallsend, and other brothers and sisters 50 years ago when they saw yowies many times on their family dairy farm not far from Ron's beef farm today. They describe them as covered in dark brown to black hair, with long hair around the neck, about the height of a tall man, bear like, and sometimes on two legs, sometimes on four. Last December, after I wrote of yowies and an Elermore Vale couple's sighting of a yowie, Joan told me how she and her family members had seen yowies alone and in family groups many times around their dairy farm. 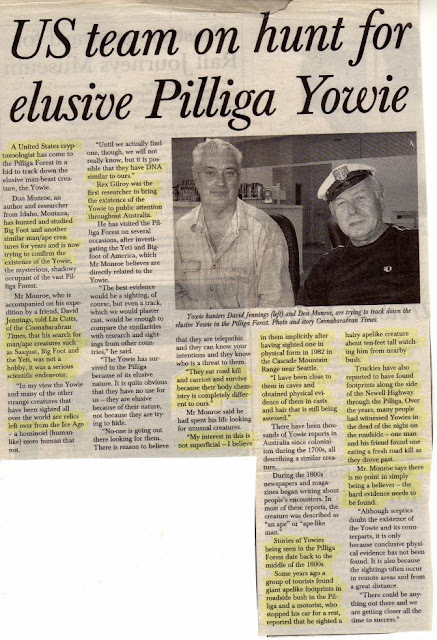 Late last week Ron told me how he had woken before sunrise one morning when he was 14 to find an adult yowie in his room, and that it stayed there for some little time until his father's alarm clock burst into life at 4.30, when it went hurrying off. 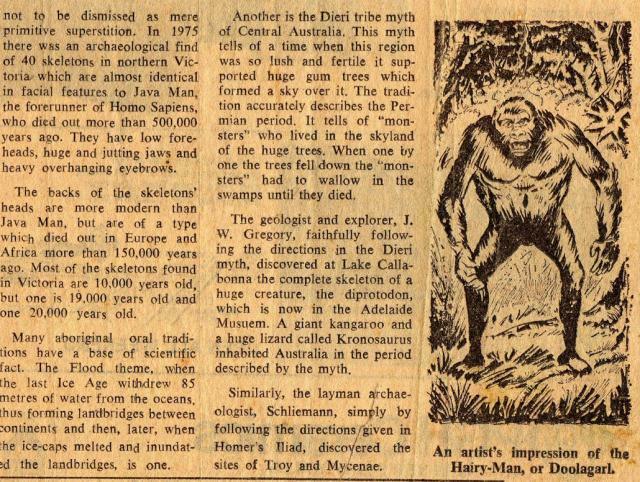 Ron's father, by the way, had refused to believe his children until he had his own encounter with a yowie. 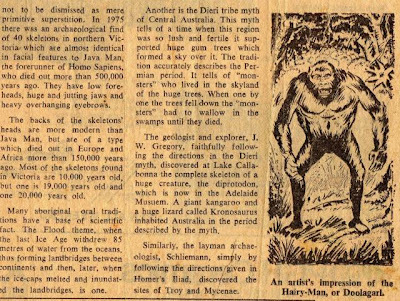 The Kempsey area has been a hotspot for yowie sightings, according to the definitive yowie book, The Yowie - In Search of Australia's Bigfoot, by Tony Healy and Paul Cropper." "At a time of accelerated species loss, it is concerning that past extinctions are still so poorly understood. Australia has a woeful record of mammal extinctions, having lost 18 mammal species over the last 200 years. The specific causes of these extinctions are unclear and, in particular, the relative importance of introduced predators (foxes, cats), herbivores (sheep, cattle) and infectious disease, is hotly debated. The popular ‘disease hypothesis’ attributes most extinctions to epidemics initiating from European domestic animals and livestock. This hypothesis lacks hard evidence but human history provides a bleak analogue – just think of the indigenous Americans who lost up to 95 % of their population to disease epidemics after European contact. Given many Australian mammal populations are currently declining (even without extensive habitat loss), it is critically important to investigate the reasons for these historical extinctions. We in the Global Ecology Laboratory are collaborating with an international team of conservation scientists to develop new software for studying extinction processes and predicting the extinction risk of threatened species. A key collaborator is Dr Robert Lacy (Chicago Zoological Society) who developed Vortex, a software package designed for population viability analysis (PVA) that has been used extensively over the last two decades for conservation assessment and planning. Our goal is to develop a flexible framework to allow multiple Vortex models to be integrated within a single ‘metamodel’, thereby extending the applicability of PVA techniques to incorporate complex multi-species systems. We have recently completed the first case study using this approach. 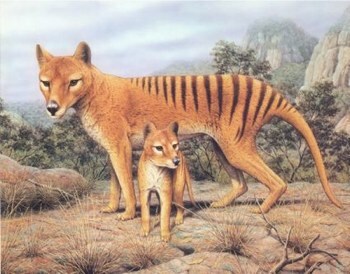 The extinction of the carnivorous, marsupial thylacine (aka “Tasmanian Tiger”) proved an ideal case study because, while difficult to explain by single factors, we know that the species was confronted with multiple extinction drivers. 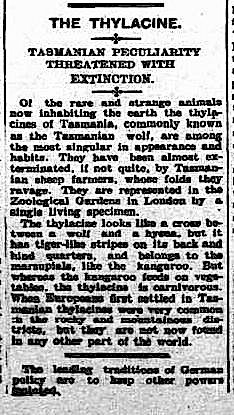 Prior to European settlement in 1803, thylacines were broadly distributed throughout most of Tasmania. In 1886, however, the Tasmanian government legislated a bounty payment for thylacines, paying bounties for 2 184 thylacine carcasses until the scheme’s termination in 1909. Only a handful of animals were located after the bounty was lifted and, in 1933, the last known thylacine was captured from the wild. 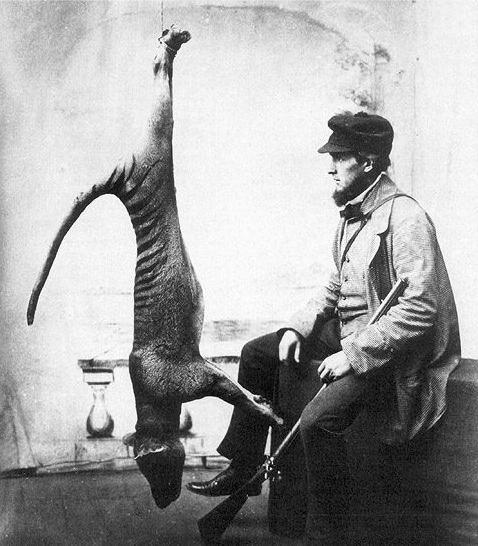 It has been argued repeatedly that European impacts (i.e., habitat loss, bounty hunting) were not sufficiently severe to account for the thylacine extinction. Furthermore, government bounty records indicate a sudden reduction in thylacine kills after 1905 which, it has been argued, is evidence of a rapid population decline most likely caused by disease. Therefore, the International Union for the Conservation of Nature (IUCN) lists disease as one cause of the thylacine extinction. 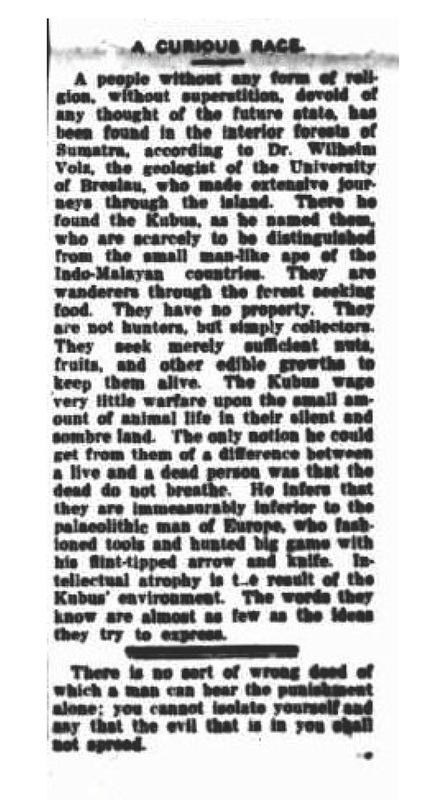 However, bounty hunting clearly interacted with many other European-imposed pressures that together might account for the thylacine’s extinction, without the need to invoke disease. The negative impact of European settlers on the thylacine’s prey base (kangaroos and wallabies) was probably very important. European settlers hunted kangaroos and wallabies for food and the fur trade and also introduced non-native herbivores (particularly sheep) to their favourite habitats. To investigate the causes of the thylacine extinction, we linked multiple Vortex models dynamically to develop a stable predator-herbivore-vegetation metamodel representing the pre-European food web. We then perturbed this metamodel to simulate the diverse impacts of Europeans, including habitat modification, bounty hunting, prey harvesting, and the rapid growth of the sheep population that competed with kangaroos and wallabies for food. We were able to simulate the thylacine extinction over a wide range of plausible initial population sizes (without needing to invoke disease) and also recreated the rapid, early 1900s population decline. The metamodel identified competition between introduced sheep and the thylacine’s prey as a critical extinction driver. We concluded that the thylacine’s demise can be accounted by known negative European impacts. The interacting effects of these impacts were powerful enough that, even without a disease epidemic, European activities committed this species to extinction. Our continuing work to develop a platform for complex systems models will be of great use for the study of historical extinctions and current conservation problems involving complex, interacting stressors." Don't fancy visiting a jungle infested with disease-carrying mosquitoes, man-eating tigers, poisonous snakes and spiders, or cryptids that don't want to be found? Then why not stay glued to our blog for the updates - and wear a t-shirt that will get your friends talking. 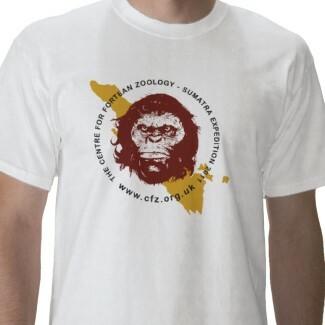 You can support this and future CFZ expeditions by purchasing a t-shirt. And if you buy one and wear it, we'll happily post a picture of you supporting the CFZ on this very blog! A group of Australian scientists known as the Devils' Advocates have taken out a prestigious Eureka prize for their work to prevent the extinction of the Tasmanian devil. University of Tasmania zoologist Menna Jones, Menzies Research Institute associate professor Greg Woods and Anne Maree Pearse from the Save the Tasmanian Devil Program were part of a team of five awarded the $10,000 Sherman Eureka Prize for environmental research. Dr Jones said the most important part of the award was highlighting the plight of the devils and the work needed to save them from potential extinction. She said the team had earmarked the prizemoney to be put directly back into the research. Professor Hamish McCallum of Griffith University and associate professor Kathy Belov from the University of Sydney also were part of the devil research team. Quolls are high on the endangered list and could afce the same fate as the Tasmanian Tiger, wildlife groups believe. 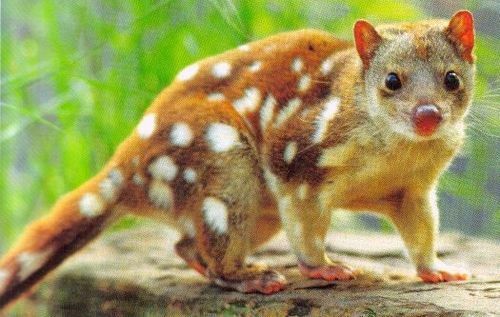 Like the thylacine, the endangered spot-tailed quoll is a meat-eating marsupial. So plans to drop bait from planes over vast tracts of land in Victoria to wipe out wild dogs threaten the little creature's existence. There are just a few hundred of the cat-sized creatures left. "A 7kg spot-tailed quoll that picks up bait poisoned at a strength to kill a 40kg dog will go the way of its eastern quoll cousins, which are now extinct on the Australian mainland," said Jill Redwood, spokeswoman for Environment East Gippsland. Ms Redwood urged the Victorian Government to reconsider baiting. But Agriculture Minister Peter Walsh said baiting would be carried out. About 5000ha of inaccessible land is expected to be included in the initial baiting. Down in Tasmania, the Minister for Environment, Parks and Heritage, Brian Wightman, has urged Tasmanians to consider the lessons of the past on Threatened Species Day and learn how they can help protect the State’s biodiversity. 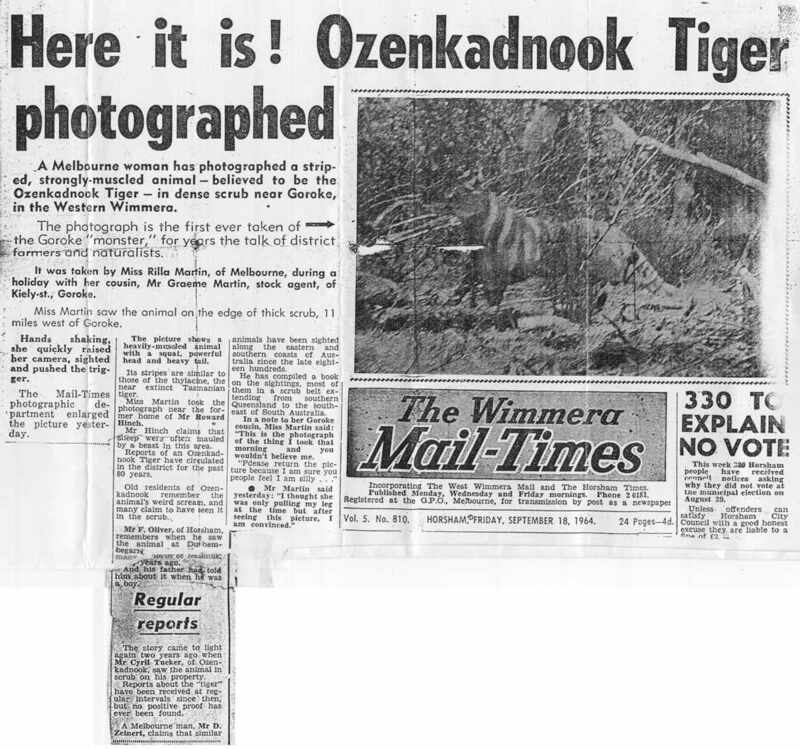 Mr Wightman said the annual Threatened Species Day, held on 7 September, is particularly significant this year because it marks 75 years since the death of the last known Tasmanian Tiger. 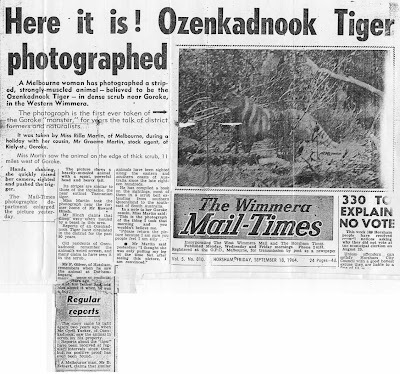 “The death of the Thylacine in the old Hobart Zoo in 1936 is a symbol of what we have lost and of the importance of doing all we can to help those species now under threat,” he said. “The protection and conservation of our threatened species isn’t something that ‘someone else’ will look after – we all have a role. “We can all be aware of what is on our land and how best to look after it. Mr Wightman said taking care on the roads and disposing of rubbish correctly were also examples of things individuals could do every day to help out. Episode 49 of On The Track (of Unknown Animals) has just been released by the Centre for Fortean Zoology, continuing the grand tradition of quality free cryptozoological content via the Internet. Highlights include snippets from the Weird Weekend 2011 cocktail party, Corinna lets her hair down and trots out her axe, the missing Lynx makes a cameo and much, much more. 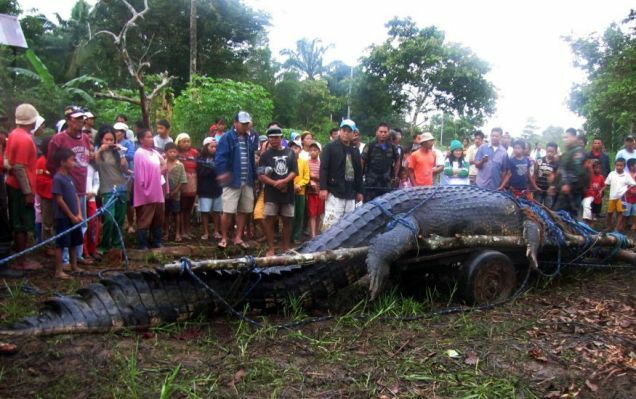 A crocodile measuring a whopping 21 feet and weighing 2,370 pounds has been captured alive in the Philippines. The male reptile was caught after a 21-day hunt in the southern province of Agusan del Sur, Nine MSN reports. Wildlife officers had set traps after residents reported a series of attacks in the area. 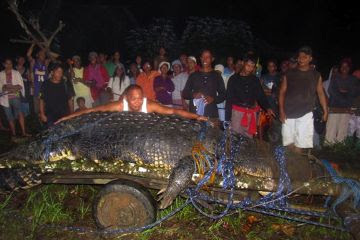 A young girl disappeared in the area in 2010, although it is not known if the trapped crocodile was responsible. The saltwater crocodile may also have eaten a farmer who went missing in July, along with several water buffaloes in the southern town of Bunawan, crocodile hunter Rollie Sumiller reportedly said. Villagers remain wary of several crocodiles that roam the outskirts of the farming town of about 37,000 people. Naturalist and ABC Radio regular Gary Opit talks about yowies, big cats, thylacines and other mystery animals of the Australian bush on internet radio. Well, hairy men at least, as evidenced by this mural discovered by eagle-eyed CFZ contributor David Hearder in Canberra. So who are these hairy men? And from where did they come? 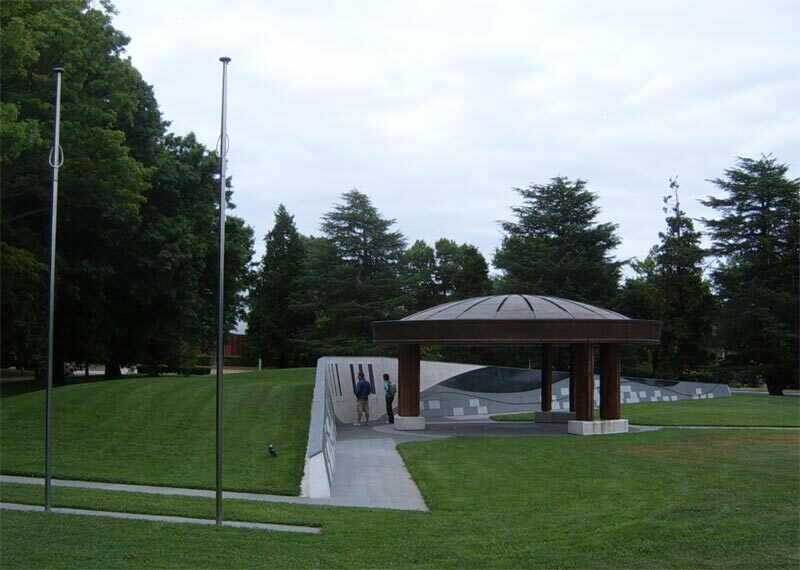 The mural is etched in granite and graces Magna Carta Place in Canberra, a monument to commemorate the centenary of Federation of Australia and a gift from the British Government. The site was dedicated in 1997, which was the 700th anniversary of the sealing of Magna Carta by King Edward I of England. But back to the hairy men. 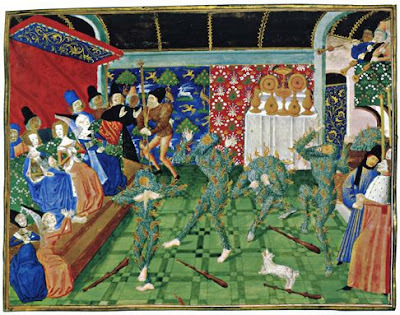 The French mural Bal des Ardents, which translates as 'Ball of the Burning Men', depicts a very real event - a rather grim ending to an evening of masquerade in 1393. As Wikipedia sums it up: On 29 January 1393, at the behest of the king, a grand party was organized to celebrate the wedding of one of the queen's ladies-in-waiting at the Hotel de Saint Pol. At the suggestion of a Norman Squire, Huguet de Guisay, the King and four other lords dressed up as wild men and danced about chained to one another. 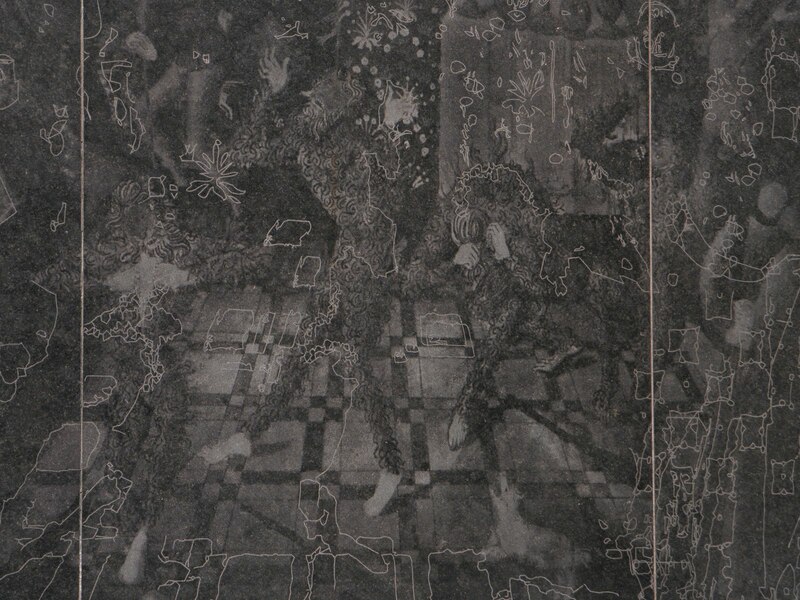 They were "in costumes of linen cloth sewn onto their bodies and soaked in resinous wax or pitch to hold a covering of frazzled hemp, so that they appeared shaggy and hairy from head to foot". At the suggestion of one of the "wild men," Yvain de Foix, the king commanded – in view of the obvious danger of fire – that the torch-bearers were to stand at the side of the room. 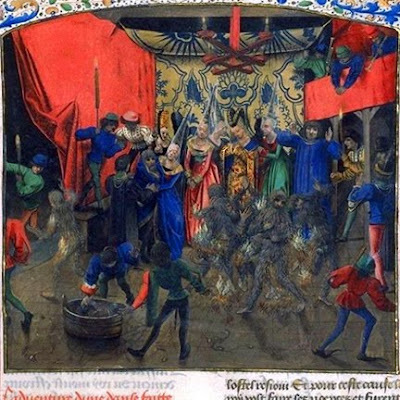 Nonetheless, the King's brother, Louis of Valois, Duke of Orléans, who had arrived late, approached with a lighted torch in order to discover the identity of the masqueraders, and he accidentally set one of them on fire. Alternatively, it may have been a plot to kill the mentally deficient king. In any case, there was panic as the fire spread. The Duchess of Berry, to save a dancer who had come near her to intrigue and tease her, threw the train of her gown over him, and it was soon revealed to her that the life she had saved was the king's. Several Knights who tried to put out the flames were severely burned on their hands. Four of the wild men perished: Sir Charles de Poiters son of the Count of Valentinois, Huguet de Guisay, Yvain de Foix and the Count of Joigny. Another, Jean son of the Lord de Nantouillet, saved himself by jumping into a dishwater tub. So you see, there really are hairy men in Canberra! Magna Carta Place in Canberra.